Kerrisdale has the feel of an old fashioned, if upscale, village. Many of the shops have been in the same neighborhood for a long time, and the best of them exude secure self-confidence; they are well established and sure of themselves. The easiest way to get to Kerrisdale from downtown Vancouver is to cross the Burrard Street Bridge and turn right onto Cornwall Street at the end of the bridge. You will be in the Kitsilano Neighborhood . Another option, especially if you’re coming from the airport, is to take Granville Street north to 41st street and turn left. Follow 41st to West Boulevard, and you’re in the heart of Kerrisdale. If you’re coming from Oakridge Centre, go west on 49th to Granville, turn right on Granville then left on 41st to West Boulevard. Once you get to Kerrisdale, find a parking place on the street and stroll around. The shopping area is only a few blocks long. 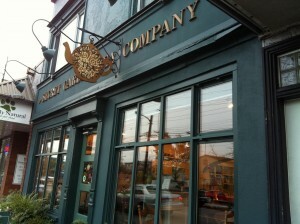 You might want your first stop to be The Secret Garden Tea Company located on West Boulevard, just north of 41st. The Secret Garden looks like your grandmother’s parlour. It has beautiful music, fresh flowers, overstuffed furniture and comfortable chairs and tables where you can enjoy a traditional high tea. You’ll find an astonishing selection of tea to go with the wonderful, miniature pastries and baked goods. The Secret Garden is located at 5559 West Boulevard. You can call them at 604-261-3070. This next place is not much of a shopping destination unless you have a dog, but the place is so great if you do have a dog or cat that we just have to mention it. At 5565 West Blvd, Simply Natural Raw Pet Food sells probably the best dog and cat food in Vancouver. It’s raw, it’s frozen, it’s high quality and dogs and cats love it. My dog Bodie loves the salmon. Simply Natural also carries treats and accessories and it offers great training classes. The owners are very helpful and very knowledgeable about pet nutrition. At the corner of 41st and West Boulevard, you can either go east or west, left or right. Go to the east if you want to eat at The Red Onion with its traditional burgers, fries and good homemade soup. Another interesting store on the east end of the Kerrisdale’s ‘downtown’ is Please Mum, a Canadian children’s clothing chain. This famous company carries an excellent array of children’s clothes, all at reasonable prices. It’s a great place to stock up on basics or an entire wardrobe. If you go to the right or west on 41st, you’ll find three of the best stores in the area: Hills of Kerrisdale, Thomas Hobbs Florist and Currans of Kerrisdale. Hills of Kerrisdale, an old fashioned department store in business since 1914 and still in business because it’s managed to integrate the best of the old with the best of the new. Fashions are high end and current, and the selection is excellent. Thomas Hobbs Florist at 2129 West 41st Avenue, 604-261-5998, you’ll find excellent gifts for others or for yourself. Everything is beautiful, and, consequently, Hobbs is a great place to browse or buy. Across the street from Thomas Hobbs is Kerrisdale Cameras. This modest looking camera store has the largest selection of new and used camera equipment in Canada. Besides the great selection, they have the most wonderful and knowledgeable sales staff who can answer all your questions and make the right recommendations. And you get to try out the cameras and see how they look and feel before you buy. We love this place. Currans of Kerrisdale, 2247 West 41st Avenue, 604-261-7071, is an old-fashioned lingerie shop with a better assortment than you’ll find in most big department stores, and the service and atmosphere are better. You’ll find local designers’ underwear and sleep wear and, in winter, one of the largest flannel pajama collections in town. Currans has been around for a long time and they are experts in their field. Kerrisdale is a great place to come for lunch or high tea and shopping. It is, in truth, a place women will enjoy more than men. It’s a good place to go with a group of women, and not necessarily young women. Exciting and hip are not words that naturally gravitate toward Kerrisdale, but it’s a great place to hang out if you’re a woman on your own or spending an afternoon with ‘the girls’. Take a look at the Kerrisdale Village website for more information about Vancouver’s most charming village.